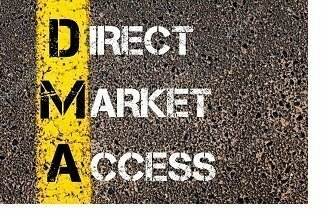 Direct Market Access (DMA), as it name implies, simply refers to a trading system whereby traders have a direct link to the market through electronic trade executions. This means that any traders with access to a DMA Forex broker can easily place any trade they wish with liquidity providers in the FX market. Although many people confuse or mix up DMA trading with ECN and STP, there are a number of features that are only unique to DMA Forex brokers. The differences between these three types of trading will be explored later. Some unique features, however, include the method of obtaining prices and the process through which a trader makes an order and how it is executed. The table below gives a summary of top DMA forex brokers. How do DMA trading work? The first process in DMA trading will always involve a display of prices on the platform. These prices are derived from liquidity providers in the forex market, which mainly consists of premier banks that stream prices directly to the DMA platform. On the other side, the trader will then be able to access the prices of the currencies and the market depth that is available as well. The liquidity providers will then populate the platform with the best prices but a small mark up is often added by the DMA forex broker. A key feature of DMA forex brokers is that the orders set out during the execution are fulfilled during the time of market execution , which is at the time when the order reaches the servers of the premier banks (liquidity providers). It is worth noting that the price at which a trader buys or sells a trade may not be the displayed price as this depends on a number of factors. The factors may include the internet speed of the currency trader, variable speeds and even quick shifts in prices. The spreads offered are always a 5-digit pricing model while some DMA forex brokers will also offer an option of exploring the depth of the market book access. An anonymous trading experience - A DMA forex broker should be able to offer a trading environment where the traders can privately execute trades on neutral prices, access the true market depth and even have an equal access to the order book. Pricing- Offer a type of pricing which is based on variable speeds that are only shifted by demand and supply forces. The pricing may also be affected the total market volume and the volatility of the FX market at the time. Conflict of interest- A true DMA forx broker will offer a trading environment where the broker and the trader do not have any conflicts of interest. This mostly comes about due to the lack of a dealing desk or third party trading. Also, a trading environment will lack a conflicting interest since the trades are independent from the volume traded and the total account size. Trade executions- DMA forex brokers are known to offer market executions with no re-quotes whatsoever. You can easily assume that DMA companies, STP Forex brokers and ECN Forex brokers offer the same type of services or have the same trading model. There are, however, a couple of differences which differentiate the two models. For example, all ECN forex brokers offer direct market access but this is not the same for STP brokers as not all of them offer this type of model. With STP trading, the FX brokerage company will use instant execution to fill out a client’s order but the broker will then have to hedge the order with the banks or liquidity providers. It is worth noting that brokers can get re-quotes in this trading model as a broker can allow it if they do not get a profitable hedging opportunity. The traders get a re-quote if a broker thinks they will not get profit from the trade. Also, prices are generally higher when dealing with an STP broker as compared to the prices that the STP broker receives from the premier banks/liquidity providers. In comparison to ECN brokers, there are also a number of differences. Although each DMA forex broker gets to draw a contract with a liquidity provider, the spreads offered by DMA brokers are rather competitive. This can be explained by two reasons. 1) ECN brokerage firms need to maintain technological solutions that have to be paid for. The solutions include facilitating, processing and the execution of trades. 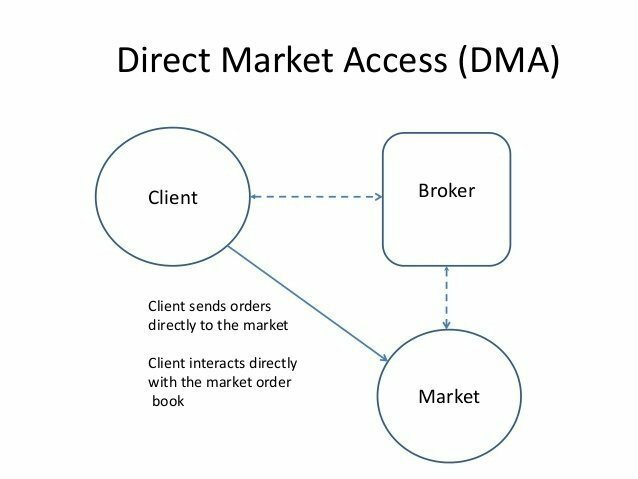 2) Unlike DMA brokerage firms, the ECN’s are not directly connected to the liquidity providers but are instead connected to ECN pools. In the direct pools, the ECN’s have no direct contact to the premier banks and may not be in a position to get the best rates from the liquidity providers. Liquidity providers are known to conceal their best prices inside the ECN pools as they are anonymous. It is imperative to note that the DMA brokerage firms do not have low spreads due to the lack of technological expenses but only because they enjoy low quotes when dealing directly with the liquidity providers. There are also other differences when it comes to execution. The prices of DMA forex brokers are streamed live from the quotes provided by the premier banks which essentially becomes the bid/ask offer. It is this feature which ensures that there are no re-quotes or rejection of rates. ECN’s, on the other hand, experience slippages or re-quotes since the anonymous market participants may place false orders and reject them. DMA and ECN forex brokers also differ when it comes to their fee structures. ECN brokerage companies get their profits from commissions while DMA forex brokers have no commissions but only add a little mark up to the spreads they offer. A review of the features of DMA trading reveals that there are a lot of positive aspects of using DMA forex brokers but there are also a couple of demerits. No re-quotes- All traders know how frustrating it is when you keep getting re-quotes especially if you were trying to take advantage of some news spike. In the case of DMA forex brokers, there will be no re-quotes which means that you will no longer get filled at a bad price. No restrictions on trading styles- There are no type of discrimination when you are trading with a DMA broker. Scalpers, for example, are a discriminated lot by other brokers but the pratice is welcomed by DMA forex brokers. No conflict of interest- There is no conflict of interest between you and your broker, which means that you will not be working for your broker but your broker will be working for you. Low spreads- While there are a variety of spreads, they are generally low. Also, these different spreads are contained within a specific band. Account inactivity - DMA brokerage firms will often penalize you if your account stays inactive for a long time. Minimum deposit requirements- unlike other forms of trading, DMA forex brokers may charge a steep minimum deposit. No fixed spreads- A significant number of traders prefer fixed spreads but this may not be your forte as its spreads are dynamic. This is an international forex broker with roots in almost every part of the world. Are you in the UK? South Africa? Or even India? You can never get too far for this broker. Founded in 2011, the FXTM Forex broker has received a breadth of experience in trading currencies among other instruments. It is regulated by CySEC which is Europe’s central regulation authority that does not allow any financial malpractices or scams. It also uses a number of platforms including Meta trader 4 and 5, which are both web and desktop applications. FXTM also has a reliable customer service that is available round-the-clock vial email, live chat on the website or on phone. Founded in 2008, HotForex has risen to become a trusted forex broker all over the world. The company received a number of accolades over the previous years and was even once voted the best online FX broker in Asia. It is headquartered in Mauritius and is thus licensed by the Financial Services Commission (FSC). Since it is registered with a legitimate regulatory body, the company has become a transparent and accountable company known for its market integrity. The brokerage firm offers a myriad of currency pairs but novice traders are advised to start with narrow-spread pairs. HotForex offers a 24/5 customer care service that is ready to answer your questions in 12 languages. Hot Forex broker Review here. Although XM is a relatively new entrant in the market, it has proven to be a trustworthy and reliable trading partner. The company operates from Cyprus and is regulated by the CySEC as well as the FCA. The brokerage company has a low minimum deposit of $5 and is thus recommended for novice traders who want to try their hand in Forex trading. There are also no commissions on the account on any transactions plus there is also no monthly fee deducted. Its customer support service are available 24 hours a day on weekdays to offer both advice and assistance to investors. With a large number of currency pairs to choose from, XM will be one of the top-rated DMA forex broker that you can rely on.